Dublin’s cycling officer may have gotten a six month reprieve, but blocking the cycle lane on Parnell Street (as pictured above this week) is continuing to be a tradition for the city at Christmas. More than anything else, the above picture highlights how a car can’t even fit in the turning lane inside the tiny less-than-a-meter-wide cycle lane. Along with the inside turning lane being too small, the cycle lane could be as much as half of the min 1.5m required by the national cycle manual. 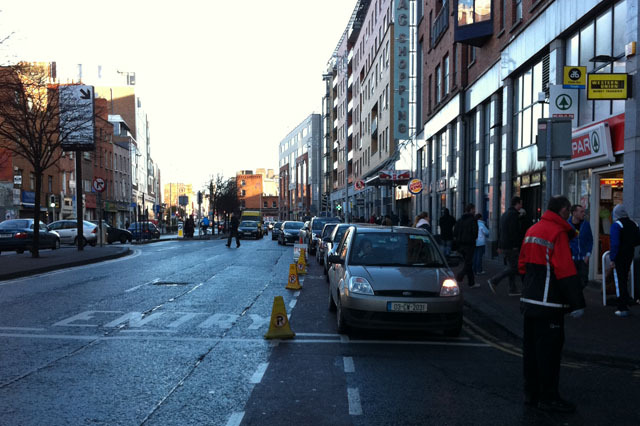 Parnell Street is a very wide street, with wide traffic lanes and a central medium which is mostly a sterile space, so the excuse that the street is too small does not compute. Lack of respect for the sub-standard cycle lanes on the street is the norm — people parking in the lanes, motorists stopping within the clearway hours, one illegal taxi rank and overspill from a legal one. And that’s without mentioning some of the parking and loading bays where drivers of trucks and buses can’t help jutting out into the cycle lane.